The Stokes Kith and Kin Community Blog: Yes, of course, feel free to question my sanity. I have several weeks been trying to get my lawnmower to work. This is the one I bought about a year ago that has an electric starter. Well, the electric starter went South some months ago, but it had a back up pull cord that worked OK for awhile. Now the thing just won't start. I've changed the oil, changed the spark plug (twice). Today I will empty the gasoline tank with the old fuel and put in some gasoline fresh from the service station, to see if stale fuel is the problem. I fear stale gas is not the problem (at least not with the lawn mower), and I will have to take the mower to the shop. That will cost not only money but a lot of time. As I was dealing with this problem yesterday, I remembered a Glenn Reynolds post about his purchasing a push mower. Great idea! No gas, no spark plug, no oil, no noise. So off I went to Home Depot and bought one. Fortunately, it was quite late in the day when I brought the box with it home (oh, so light! ), assembled the handle and connected it tothe base unit (oh, a marvel of engineering! ), and started to push. And push. And push. Ugh! It was hard! But the sun was on its way down, and so I soon had to stop. That was a good thing, because it was a work out. I should have gotten ready with a strict, six-month kettle bell regimen. But I didn't. 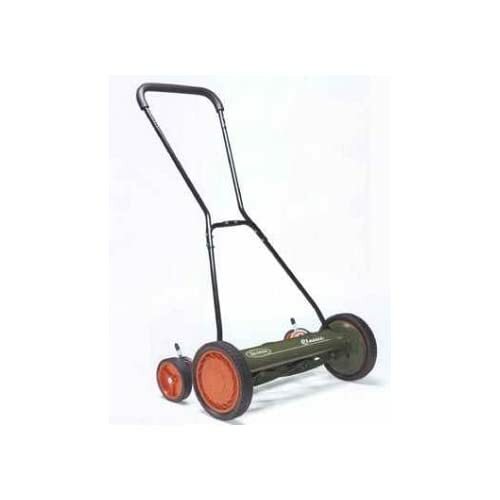 Just yesterday I was wondering about push mowers - if they'll be the next craze in this "go green" fad we seem to have entered. You'll have to keep us posted. :) I won't run out and buy one today.